Well, today 26 people came to the Cartoon Art Museum to create comics and art. 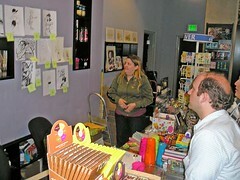 Members of the Cartoonist Conspiricy San Francisco joined with the Cartoon Art Museum Bookstore for a Comic Jam. Starting at 11 am artist begin to arrive at the Museum and were given a special custom lanyard while we finished setting up in the Museum’s lobby. First off, artist were invited to help design the Bookstore’s online persona ‘Sparky Joe.’ Sparky Joe is a mash up of Olive Oyl, Wendy the good little witch, wolf girl from Lil’ Abner, and Disney’s version of Tinkerbell. At noon we started the comic jams. One table did a series of illustrations that had an adventuring girl over the course of a day. 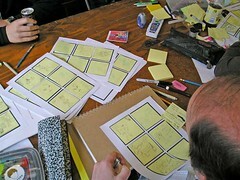 The other table had two groups who worked on comics on Sticky Notes. The Sticky Notes allowed for us to create a collaborative story that can be rearranged and adjusted creating a more solid tale. The jams will be on-line in the next few weeks. Later in the day we tried something new, Speed Comic Jams. We took pre-printed pages with three cinema scope panels and posted four of them on a tablet on a stand. The first time had each artist taking turns filling in the panels one by one with only one minutes per panel. We drew in pencil with a random theme with the words: Cinderella and Detective Tale. That produced loose rough drawings. The next version had two artist drawing two pages at the same time with two minutes per panel. The theme was Glam Rock Beach party. This time we drew with Sharpie pens which made the artist work simpler and cleaner. We did the challenges a few more times, finially returing to panel by panel at two minutes a time. Around 4pm we had a few more artist finish some “Sparky Joe” drawings and then at 5pm we all voted along with shoppers in the Bookstore. Manager Heather had a hard time picking from all the designs so this made it easier. In the end there was a three way tie, so we had another round of voting with the winner being artist Audry Soffa (of the web comic the Bunny System) who’s art will be uploaded soon to Facebook. If you want to be a friend of the Cartroon Art Museum Bookstore, just search Facebook for Sparky Joe or you can follow on Twitter as well. It seemed that everyone had a really good time and we were really productive. We hope to have some comics on-line soon and look forward to returning to the museum sometime soon. Is anybody interested in showing at the 2009 CCCC show in Winnipeg, CA? I’ve signed up and if someone else was interested in ride-sharing, I would be happy to have him/her along to split gas and lodging. The Artist Tables are free of charge and they provide snacks to the artists. email “Maria” to get yourself setup; her email is: cencon@mts.net. You will need a passport to get into Canada. Damn Terrorists. little funny is intended as a prominent “sideshow” to the upcoming BIG FUNNY project. little funny will be a series of mini-comics sold in an old cigarette vending machine at Altered Esthetics during the month of the BIG FUNNY show. No entries will be rejected provided they follow the specs (these comics need to be a specific size to fit inside the boxes in the vending machine). DOWNLOAD THE TEMPLATE. The template includes a little funny logo on the front and back covers. One double-sided copy makes three copies of a 10-page accordion style micro-comic (or, alternately, 3 different issues). Email us at webmaster (at) cartoonistconspiracy.com for an issue number. little funny will be a numbered series. Make sure to put your number on your comic. If you choose to do multiple issues, you’ll need a number for each different issue. Draw your comic. Make sure to sign your work and include your contact info on it if you want to. Make copies of it. Copy, fold and staple them. In addition to the comics please include your name, address, phone number and email address. DEADLINE FOR PARTICIPATION IS JULY 20th. Each participant will receive one vending box of minis… how many minis are included in a box will depend on our level of participation. No box will contain all of the minis. Each participant will be responsible for picking up their box some time during the month of the show, or for making special arrangements if they can not attend. Participants names will also appear on the BIG FUNNY website as being a part of the little funny show. These comics can be by a single artist or be collaborative. You can do as many issues as you wish… if you want to do more than one, just ask us for another number. Comics may be color, or black and white, or on colored paper, or decorated with glitter glue, or painted or whatever the hell you want to do as long as you stick with the basic template. Two sets of all the comics will be kept for the Conspiracy archives. All proceeds from the comics will go to support the gallery, Altered Esthetics, which is a non-profit, community and artist centered gallery. You can read more about AE here. 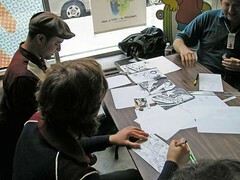 CCSF Comic Jam at the Cartoon Art Museum Bookstore. Collaborative Jam Comic on Sunday May 31, 2009. Details of featured artists will available soon. Big congratulations to Conspirators Ken Avidor and Kevin Cannon on both winning a gold in the Society of Professional Journalists Page One Awards. Ken won a gold (with Steve Kaplan) for best commissioned illustration for his piece The 2008 Republican National Convention: A Graphic Novelette. 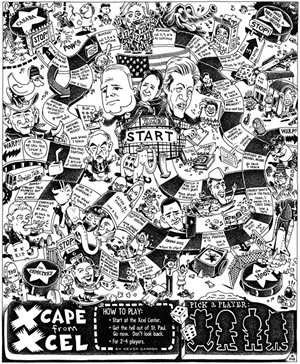 Kevin won a gold for best Editorial Page Cartoon for his piece Xcape from Xcel (done for the City Pages Comix Issue last year). Nice work, fellas! More “graphic” than “novelette,” Avidor and Kaplan do a nice job summing up the RNC in a format that gives the reader the gist of the event far more efficiently than paragraphs of prose would do. Well done. This is not a “get it at a glance” editorial cartoon. The detail and thought that went into it took some time to appreciate. The political faces are well done. Just the idea of politics as a game gives this another level of meaning. We identify with “electrocuted while punching a TV”! Read more at the Big Time Attic Blog here. Hey all, passing on info on an upcoming Anthology produced by Bay Area artist Erin Milligan. These are just the general guidelines. Submission format: Black and white. Please submit all files as 300 dpi TIFF files. Length: 4 to 12 pages per story. Reimbursement: You will be able to buy it off me for a set price**; any profits you make off of the book are yours to keep. You may sell the book at conventions, at shops, and/or online. Rights: You may not submit the same story to other publishers until nine months after the anthology has been printed. Also, you may not post more than half of your story online until that nine month period has passed. 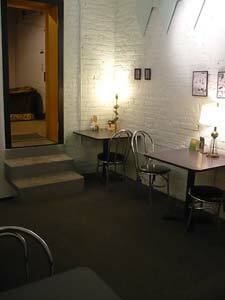 See this coffee shop? Its called Diamonds(http://www.diamondscoffeeshoppe.com/) . Its where the MPLS cell holds it’s monthly meeting. It’s also where this weekend we will be having a “gallery show”, promoting our group, drawing, and selling our various comics during Northeast Minneapolis’ annual ART-A-WHIRL (www.nemaa.org). Friday from 5-10pm, Saturday from 12-8pm, and Sunday from 12-5pm. Stop by and say “Hey” on your whirly tour of Minneapolis art. 7000 BC will have a table at the Albuquerque Collectors Con on Sunday, May 17 at the Sandia Courtyard (formerly the Howard Johnson’s) at I-40 and Eubank. We’ll have comics from the group and be doing sketches and caricatures.